[Minifloat] is using his TI Launchpad development board as an In-System Programmer for AVR chips (translated). There are a ton of homebrew AVR programmers out there, and using an Arduino for ISP is quite popular. But recently we searched for a way to use the Launchpad as a programmer and didn’t find one. We’d venture to say this is the first. There is one hardware modification that must be made. An external clock crystal (32.768 kHz) must be populated on the board. But since it was designed with the feature in mind that’s a pretty quick process. [Minifloat] followed Atmel’s ISP app note, and extended some of the code written for a different programmer to get things up and running. At first the device wouldn’t communicate with AVRdude, but that turns out to be a problem with the initialization conversation. AVRdude polls the connected programmer to see if it supports block mode, and the firmware on the MSP430G2211 wasn’t expecting this query. The problem was fixed and it now works. It sounds like there are a couple of bugs left in the system. The first time AVRdude accesses the programmer after it has been plugged into the USB port it will fail. Subsequent attempts will succeed until the MSP430 chip is reset, or the USB connection is replugged. But if you’re just getting into the AVR line, this will let you figure out if you want to invest in a proper programmer. The MSP430 launchpad comes with that crystal. 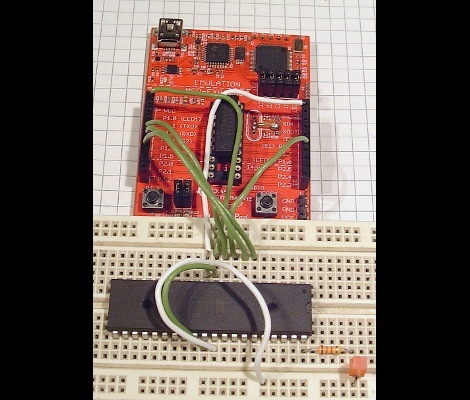 I used a MSP430 Launchpad (with 2553) to program the PIC24 on the Bus Pirate. Didn’t require a booster pack because the PIC24 is a low voltage chip– just a few wires and one resistor. Crystal is populated but not required. too heavy software? have you tried msp-gcc yet? it’s usage is quite similar to avr-gcc. with a IDE, which supports makefile projects, you can make your projects even “look and feel” all the same.